The world is a big place and it’s full of prospects. Following the old way of ‘study hard, go to a good school, get a great job, and work your way up the ladder’ is practically finished. Success today, whether it’s in a job or owning a business, is all about creating value. When you’re in a developed country surrounded by hundreds of millions of people who share similar skills, it can be a bit competitive to do this. Then why not join something that has been developed by your father? Studies show that more youth are restraining themselves from joining their fathers’ business. Certainly, for an industry like trucks & logistics, joining the business is something the sons avoid to do. But with the launch of pioneering trucks & technology in the trucking industry in our country, youth are planning to join their fathers’ hard earned company. Mahindra Navistar has initiated ‘Papa Ka Business’ campaign – which motivates & encourages youth to join their fathers’ business. This is not only related or restricted to the logistic industry, but rather takes a wide approach to inspire youth to join their family business. The first part of the campaign is the ‘Ok is no longer Ok’ on Facebook which is running a ‘Papa Ka Business Video’ storytelling contest. Fans will answer simple questions everyday based on the short 10 second edit of the TVC. A new question is introduced every 2 days for the fans to answer. The second part is around fans & online visitors submitting entries with their experiences of working in their family business, on the website Papakabusiness.com. Contest winners will be awarded with iPod Nanos. The great thing about being young is that you have nothing to lose and everything to gain. It’s the only time in your life that you won’t be burdened with other responsibilities. 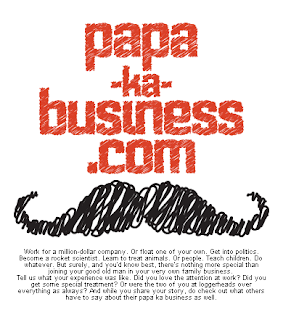 So join your ‘Papa Ka Business’ and lead your own company & achieve new heights. Overloaded Trucks – Be Cautious!